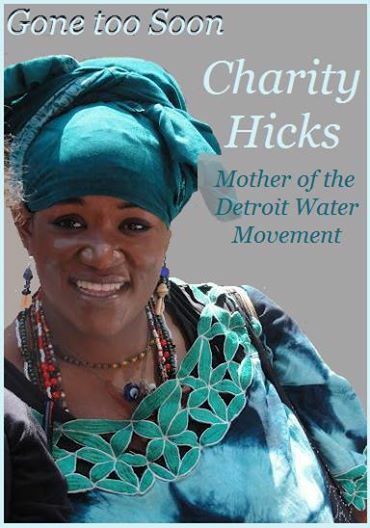 Charity Hicks - Passed away July 9 after being in a coma since May 31 in a hospital in New York City after being assaulted by Homrich employee and then arrested by Detroit police. 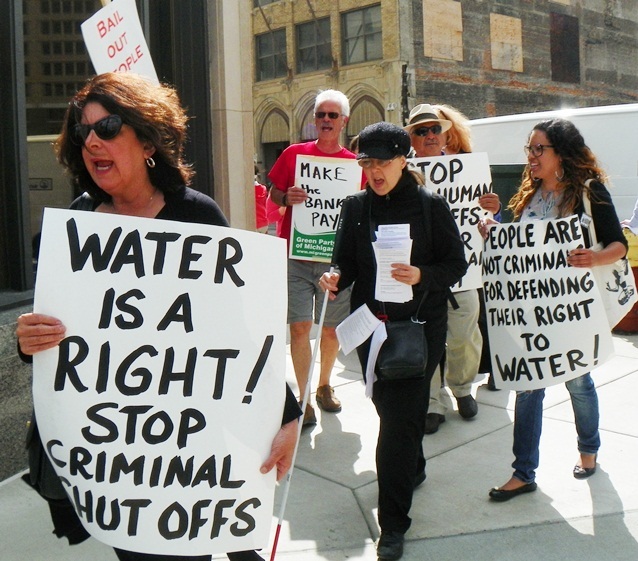 Protest 5/23/14 - Marcher demands hit big businesses who haven’t paid their water bills first. 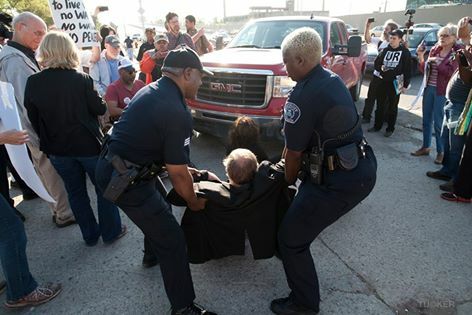 On July 10, 2014, 8 people were arrested during a protest at the gates of Homrich Inc, the company that facilitates the controversial program in Detroit to shut off water service for nonpayment. Detroit’s Emergency Manager Kevyn Orr ordered water shutoffs for 150,000 Detroit residents in the spring of 2014 for those late on their bills. Orr was appointed to manage Detroit’s bankruptcy and make all financial decisions on behalf of the local elected government . Detroit citizens have been protesting on the basis that water is a human right that cannot be denied to families who need it for cooking, bathing and flushing toilets . The United Nations (UN) affirmed water as a human right in 2010 , a declaration the United States has consistently opposed and in 2007 held that under the U.S. system of government, while there are many federal laws and regulations aimed at promoting safe drinking water and sanitation, states have sovereignty over many water issues . A police spokesman stated that while protesting is not illegal, there are rules, namely that “you cannot impede pedestrian (or vehicle) traffic. You cannot stop someone from moving” . 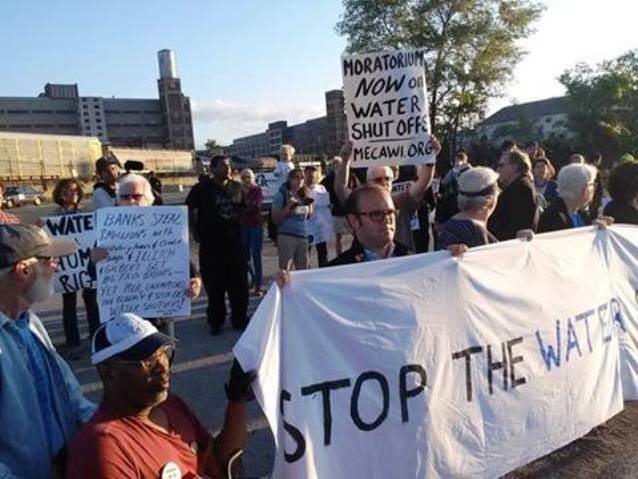 There were about 50 protesters, including individuals and representatives of various activist groups- among them the Detroit People’s Water Board, the Detroit Water Brigade, and the Michigan Welfare Rights Organization . Activists claim that police should not be arresting peaceful protesters like themselves, rather police should be arresting criminals such as rapists and murderers . The Detroit Water and Sewerage Department contracted Homrich (a Michigan-based company) to execute the shutoffs at a price of $5.6 million. In June, water was shutoff to 7,210 homes. Water was restored to about 3,000 homes after DWSD received payment, however there are about 4,000 homes still without water and DWSD is uncertain whether these homes are vacant or occupied . Protestors demanded an immediate end to the shutoffs and have advocated the implementation of the Water Affordability Plan drafted in 2005 and accepted by Council in 2006 . Many residents facing water shutoffs are currently on monthly payment plans with the Detroit Water and Sewerage Department (DWSD), paying over $160 per month as water rates continue to rise, and were given no prior notice that their water was about to be cut off. To add to this challenge, the Detroit City Council held a public hearing to discuss a proposed 4 percent hike in water rates . 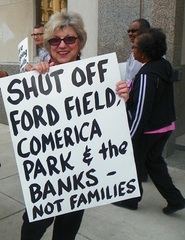 Activists note the injustice in water being shutoff to families who are unable to pay their bills while prominent Detroit corporations (Palmer Park Golf Club, Joe Louis Arena, Ford Field) with much larger delinquent water bills are being left alone [3, 10]. Some have labeled the water shut-offs as a public health emergency, however the Department of Community Health is confident that no public health emergency exists in Detroit . In response to water shut-offs, the Detroit Water Brigade has developed a plan of action involving nonviolent direct actions. These include the distribution of various water supplies (water coolers, bottled water, etc.) and flyers instructing people on how to turn their own water back on after it’s been shut off, and how to pre-emptively stop contractors from shutting water off for their home. This group is also meeting regularly to train interested residents in nonviolent civil disobedience such as the human chain. In response to sustained protests from Detroit residents, the DWSD has removed the “Water Shut Off” decals from its trucks . The DWSD announced in July 2014 a water assistance program with $1 million in funding to help customers who can’t afford water. This program is financed by a voluntary 50-cent surcharge the department has collected for several years. Additionally, the department refers those with financial troubles to aid organizations at the county and state levels. The Governor’s office holds that no one who is truly in need of water will go without it because of the many programs available to residents . Food and Water Watch notes that the extensive service disconnections are closely tied to Orr’s plan to privatize the water and sewer system. In June, he received final bids from interested water companies, but no information has been disclosed as of mid-July regarding this. Thus far, organized public resistance has fended off privatization attempts . A democratic gubernatorial candidate called for a moratorium on Detroit’s water shut-offs until city officials can assess who has the financial means to pay off lapsed accounts as well as who legitimately does not . 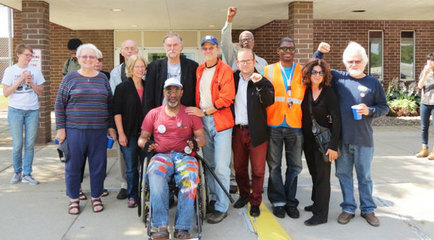 Shortly after this, the DWSD announced a 15-day pause in water shut-offs but emphasized this was not the result of political pressure from activists or the UN, rather “the moratorium,” according to DWSD spokesman Bill Johnson, “was a result of our own concern we may have missed some people who truly can’t pay their bills, and we want to give them an opportunity to come in to see if we can help them out” . On Monday July 21, 2014, a group of Detroit residents filed a class-action lawsuit in U.S. bankruptcy court, claiming a shutdown of water services to about 30,000 low-income households violates their constitutional rights . The lawyer stated that the lawsuit seeks an injunction to end DWSD water shutoffs for nonpayment of water bills while asking the bankruptcy court to demand DWSD implement a “water affordability” program with income-based payments for low-income households . On July 22, the DWSD announced that it will hold a Water Affordability Fair on August 2 to "further assist customers with financial hardships" . On July 29, following intense national and international criticism, Orr placed control of Detroit’s water department in the hands of Mayor Mike Duggan who stated that while he agrees that people should pay their water bills, water department officials could have been more sensitive in how they handled past-due bills and the increased shutoffs. Duggan promised a new plan on how to deal with the issue . Project Details Detroit's water system serves about 700,000 city residents and 4 million people in southeastern Michigan, but the city-owned water system has about $6 billion in debt that's covered by bill payments. As of July 1, more than $89 million was owed on nearly 92,000 past-due residential and commercial accounts . The average overdue water bill within the DWSD is $540 . Detroit had staged a mass shutoff as a means of collecting past-due bills of as many as 3,000 households per month . Water service has been restored to 43 percent of the shutoff customers after the past due bills were paid . The federal EPA recommends that families spend no more than 2.5% of their pretax income on water and sewer service, however some Detroit residents have been paying more than 20% . Other Health impacts resulting from limited or no access to clean water. Affecting poor families with limited health care. Development of Alternatives There are no alternatives to this conflict, simply just a call by activists to have their water turned back on and in public hands with participation mechanisms of all citizens and for all customers (residential and commercial) to be treated alike. Why? Explain briefly. This is an ongoing case so it is difficult to judge at this point if environmental justice has been served. Positive changes are being made but there are still many without water and there is still a discrepancy in that commercial customers have not had their water shut-off for lack of paying their bills. Charity Hicks Passed away July 9 after being in a coma since May 31 in a hospital in New York City after being assaulted by Homrich employee and then arrested by Detroit police. 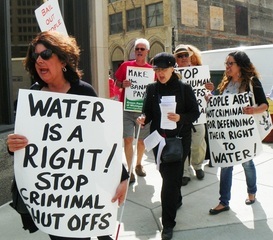 Protest 5/23/14 Marcher demands hit big businesses who haven’t paid their water bills first. Other Comments This is an ongoing case and has updates nearly every day. It is likely that the conflict will be resolved soon so what I have described may not be the most up-to-date account.